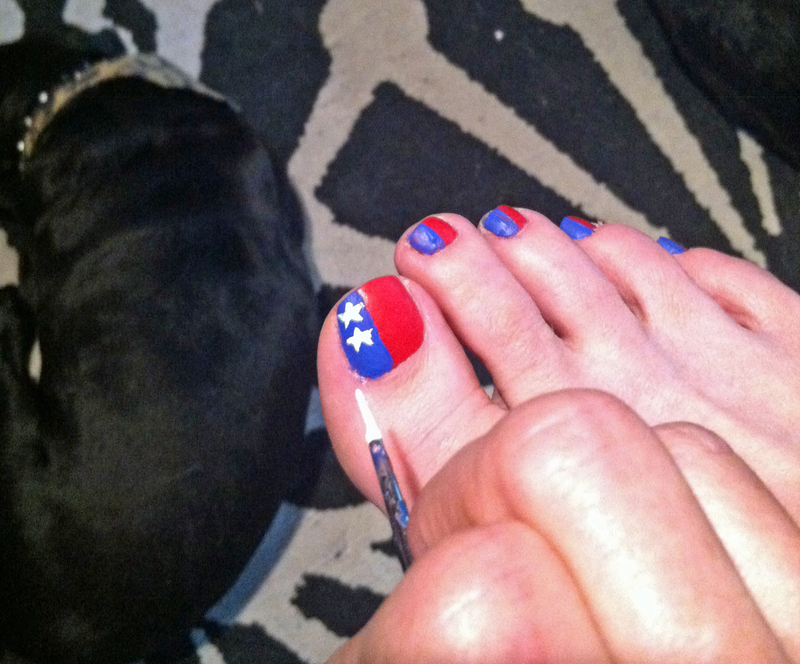 Star-Spangled Toes for the Fourth! 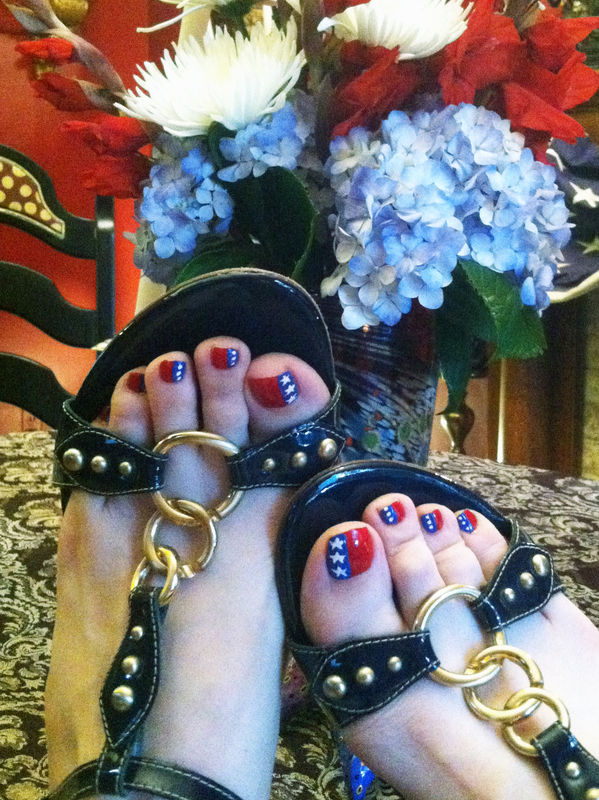 I’d been wanted to play with some fun nail designs, so I got all Patriotic on my toes. 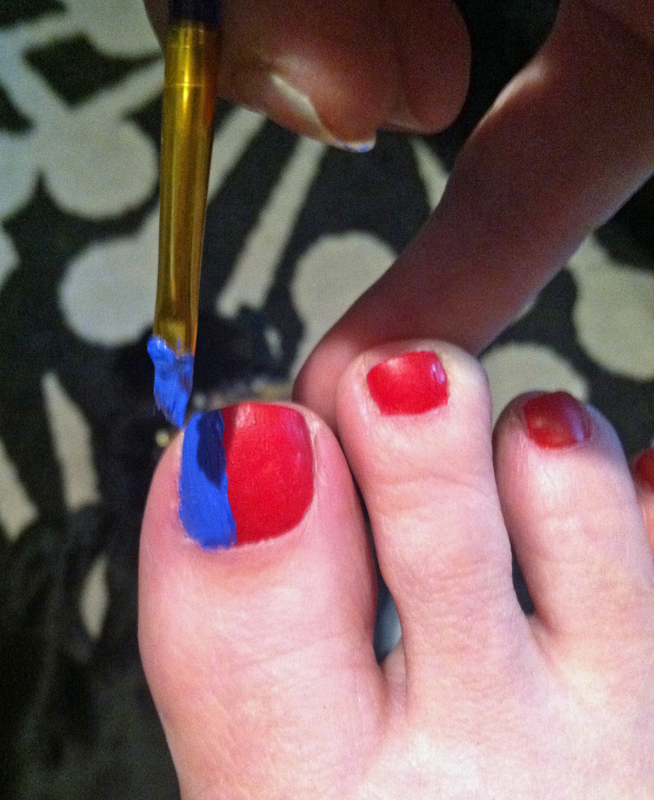 I did not however have blue nail polish, so I got creative with acrylic paint. I started with a base coat and two coats of red nail polish. After the polish was completely dry, I gave it a light “sanding” with a fine nail file pad. Just like you do when painting, I roughed up the surface of the red to get it ready for the acrylic paint. Then came the wide stripe of blue acrylic paint. After that dried, I painted on the white stars and dots with white acrylic paint. When it was all thoroughly dry, I finished with a coat of clear polish. This is the tricky part. The top coat has be done with a thick layer, slowly and smoothly applied in a single long stroke. If you try and go over it again while wet, the paint underneath can come up. This technique worked great! I did up my toes almost a week ago and they still look great. Have a Fantastic Fourth of July everyone! Have you been sporting some great Nail Designs? I’d love to see them! Tell me about it in the “Leave a Reply” section. This entry was posted in Beauty, DIY, fashion, Nail Art and tagged 4th of July beauty, 4th of July nail art, budget, DIY, fashion, fine living, fourth of July nails, lifestyle, nail art, nail art paint, nail designs, pedicure, personal style, red white blue nail art, style. Bookmark the permalink.